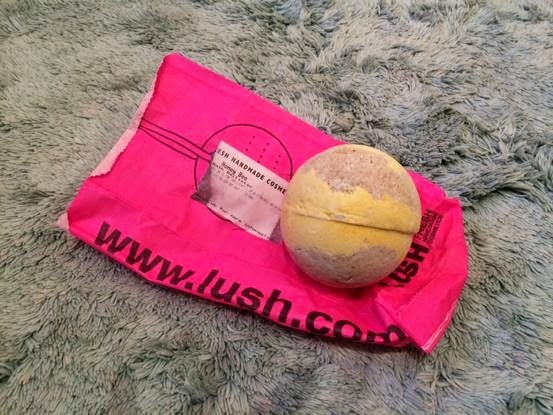 I was lucky enough to receive a few Lush items for Christmas, one of which was the Honey Bee bath bomb which was in my stocking! My mum chose this one for me because of my horrendous skin problems (eczema and acne), and I decided to give it a whirl. Honey Bee contains honey, aloe vera, and rhassoul mud - all of which are renowned for being wonderful at soothing and calming problem skin. Honey is antiseptic too which is always a bonus! I threw this in my bath and watched it turn the water a luminous yellow colour (I have to admit it did look ridiculous and pretty gross...) then I jumped in. My skin normally stings when I'm in the bath but it felt soothed as I slid into the warm water, and when I got out my skin didn't feel dry & tight as it usually does - for me this is enough to have me repurchasing it forever! It left my skin feeling calm and nourished, which is something I'm always looking for. Honey Bee also smells delicious which I believe is due to the orange oil, making for a particularly enjoyable bath time. At £3.35 I will definitely be stocking up on a few of these for the times when I'm home from uni and can indulge in a nice relaxing soak. I'll be blogging twice a week during 2015, on Mondays and Fridays - although there may be extra posts throughout the week too. Follow me on Twitter & Instagram (both are @katygilroyblog) to stay updated!